I decided to go with a First Chapter Tuesday today because I wanted to jump more into the Halloween spirit with a ghost story! I'm not generally a big fan of horror stories, but I've been extra excited for the fall and Halloween season this year, so I am celebrating by reading a multitude of perfect Halloween books. I started The Harrowing over the weekend, and while it isn't anything groundbreaking, it is still a classic, enjoyable ghost story about five college students who begin to have supernatural experiences. "It had been raining since perhaps the beginning of time. In the top tier of the cavernous psychology hall, Robin Stone had long since gven up on the lecture. She sat hunched in her seat, staring out arched windows at the downpour; feeling dreamily disconnected from the elemental violence outside, despite the fact that every few minutes the wind shook the building hard enough to rattle the glass of the windowpanes." Read the Goodreads summary here! The beginning paragraph definitely sets a dark, gloomy scene. I especially like the opening sentence. I live in the Pacific Northwest, and I can relate! 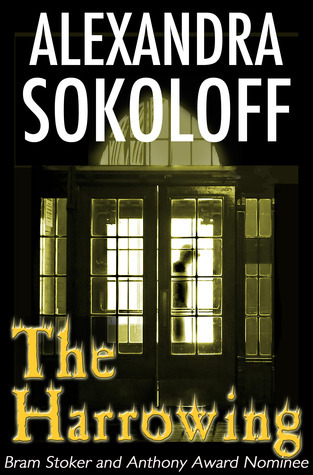 I have enjoyed Alexandra Sokoloff's thrillers and think I might like this one too! Thanks for sharing. I don't normally read Horror, but I do like the mood the first paragraph is setting. Enjoy, and Happy Halloween. Sounds like a good choice for october.